Chris played this Strat - which appears to be from the 50's - in The Jynx, circa 1965. Chris used this Tele in one of his pre-Big Star bands, Rock City. Chris' main guitar during his Big Star tenure was a mid-60's Gibson ES-330, finished in Cherry. This guitar is still owned by the Bell family but remains on loan to Ardent Studios. Right: A recent photo of Chris' Gibson ES-330 at Ardent Studios, leaning against Jody Stephens' Ludwig "Oyster Pearl" kit. 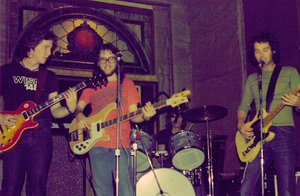 Chris used a sunburst "non-reverse" Firebird III on Big Star's first and only tour with the original lineup, 1972. 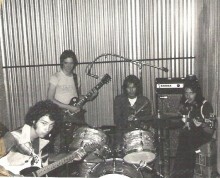 Right: Big Star on their one and only "tour" with all four original members. Towards the end of his tenure with the band, Chris' personality began to turn volatile. In one of the more infamous tales, Chris got on Andy's case about not being able to play a bass line right during a rehearsal. Andy, in turn, punched Chris in the face. Chris, with blood running down his nose, smashed Andy's new Gibson Thunderbird bass; Andy retaliated by punching four holes in the top of Chris' Yamaha FG-180 acoustic guitar with a screwdriver. Andy ended up with the guitar and later gave it to Jody, who wrote "For You" on it. He still owns it today. The holes are covered by gaffers tape. This early 60's Fender Stratocaster is most likely "The Big Star Strat", heard throughout #1 Record and Radio City. This guitar is notable for its missing or painted pickup covers, unusual black refinish (it appears to have a matte quality to it, and is flaking around the heel in the cutaway), and missing its headstock logo (possibly sanded off during the refinishing process). 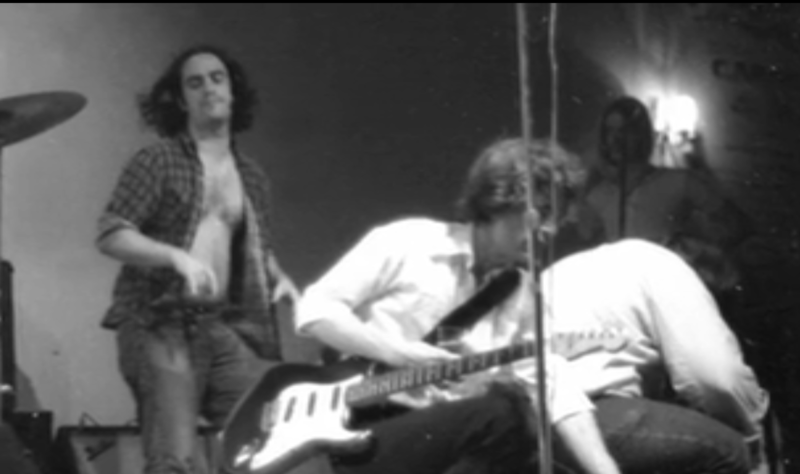 First seen in the 1967 footage of The Box Tops miming to "The Letter" (see below), it is also the guitar Chris is playing In the only known footage of the original incarnation of the band (see below). 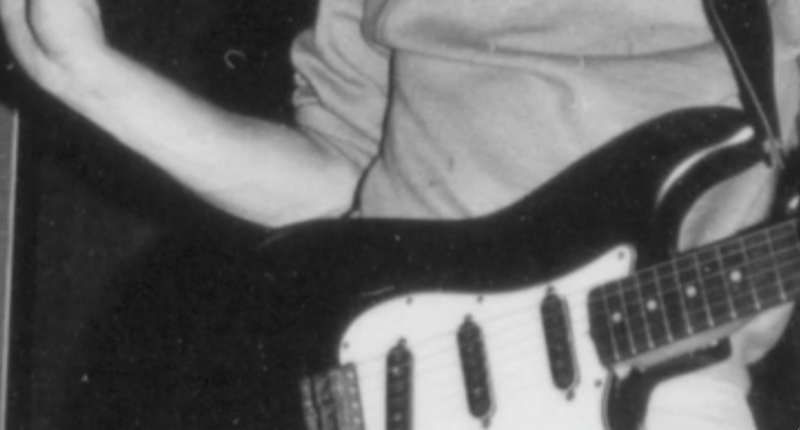 Alex later used this same Strat on tour with Big Star (seen below at the Rock Writers' Convention, 1973). 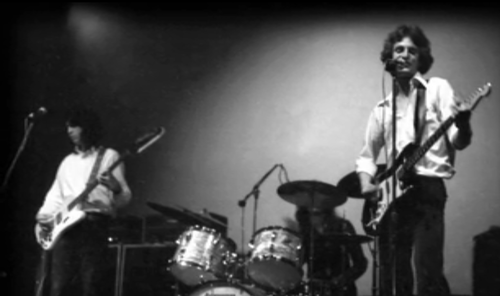 The band's gear was stolen on March 30th, 1974, the night before a concert in Cambridge, MA (opening for Badfinger). Alex lost several guitars, including this Strat.